If you want to get away from the norm for your next meeting or conference, consider a getaway to Granbury for a meeting with a view! The 20,000 sq. ft. facility can be divided into as many as ten smaller spaces to accommodate groups of various sizes. The gorgeous, state-of-the-art facility overlooks the main body of Lake Granbury. The great audio/visual services and internet access can make your next conference, convention or retreat one to remember. Just a few feet away, your guests can walk the City Beach Boardwalk or the sandy beach to enjoy the views of the famous Lake Granbury. 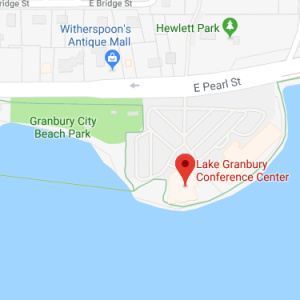 Just a short walk from the Historic Granbury Square, you’ll find the Lake Granbury Converence Center across from Hewlett Park and neighboring the City Beach Park. We are here to help make your event stress-free with State-of-the-art equipment.